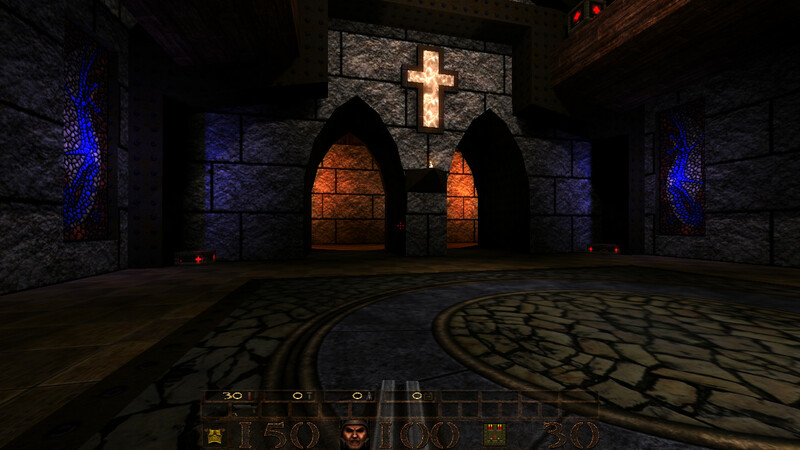 The goal of this project as a whole is to modernize Quake’s aesthetics as much as possible without changing the mood, theme, or atmosphere of any setting. Furthermore, this project will cooperate with engine designers and listen to the community to provide the end-user with an easy-to-install pack which will be used simply and efficiently by the Quake engine. 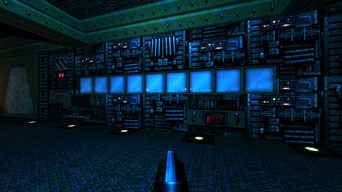 Today QRP release our first add-on pack for Quake mission pack 1: Scourge of Armagon (SoA)! As the add-on name implies you will also need to have QRP’s Map textures v.1.00 (QRP_map_textures_v.1.00.pk3) pack installed to get replacement textures for all textures in SoA. Note also that this add-on release only includes diffuse and luma textures! Due to the controversy between Hipnotic and 3d Realms at the time I would guess it is the latter! Last I would like to thank OoPpEe for the suggestion to add transparency to the sfloor4_3 texture in the SoA start map. 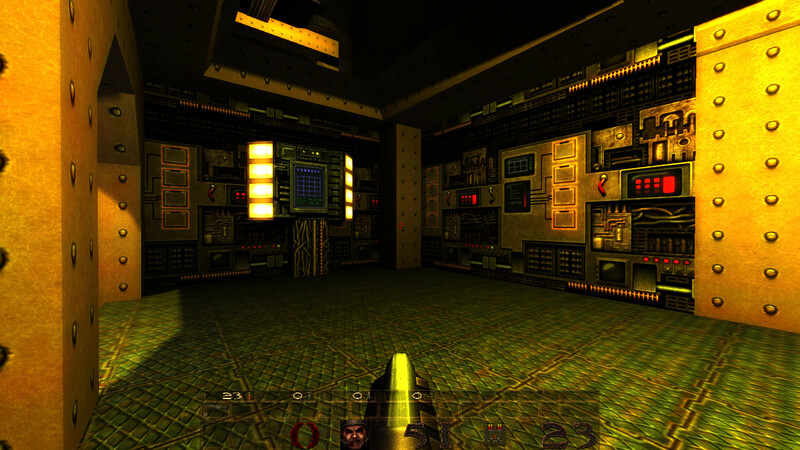 Looking through the windows now reveals two ‘rooms’ equipped with lasers! As one of the longest running projects within the Quake/Quakeworld community QRP would like to welcome you all to our booth! 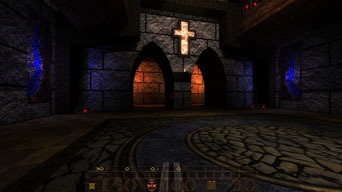 Through its 9 years the project has seen its ups and downs but last year’s releases which included replacement textures for all map/world textures for Quake, both as regular diffuse textures as well as normal map textures, must count as QRP’s best to date. Of course there have been those who do not like our contributions over the years and that is fine with us because replacement textures are not for everyone. 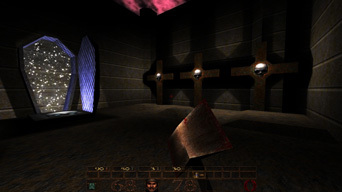 QRP deliver one interpretation of how Quake can look in 24 bit and if you do not like it your welcome to show us yours! Later during this expo QRP will release a new add-on pack! 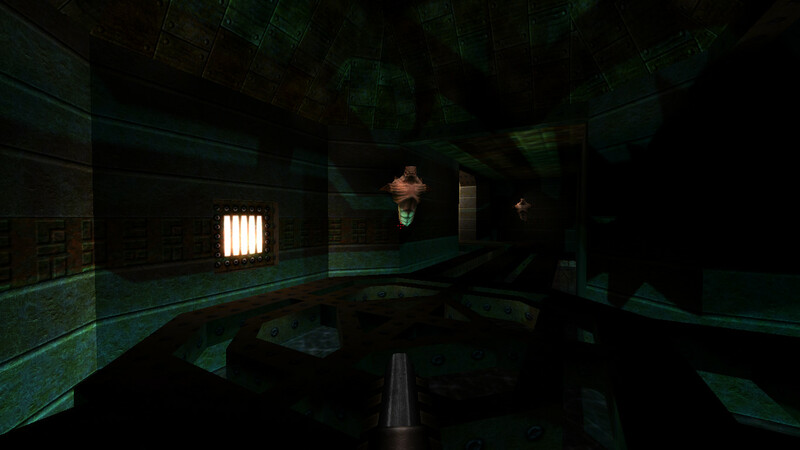 Until then check out some screenshots from the Quake mission pack 1 (Scourge of Armagon) below.